Just listed in the soughtafter community of Montecido in Portola Hills, this lovely 2 bedroom/2 bath Carriage Unit. Contact: Kelly to schedule a showing. Kelly's positive attitude towards fulflling her clients dreams has made her one the premier real estate professionals in the Saddleback Valley. Kelly grounds her optimism with sound business and marketing skills, as well as experience negotiating mult-million dollar contracts. More importantly Kelly takes a big-picture approach to her cleint's goals. She understands each sale is connected to another purchase, and each purchase to an eventual sale. Kelly is commited to make sure all your goals, both short and long term, are part ofa larger plan that's guiding you towards success. If you're looking to buy or sell a home, contact Kelly to schedule a free consultation. 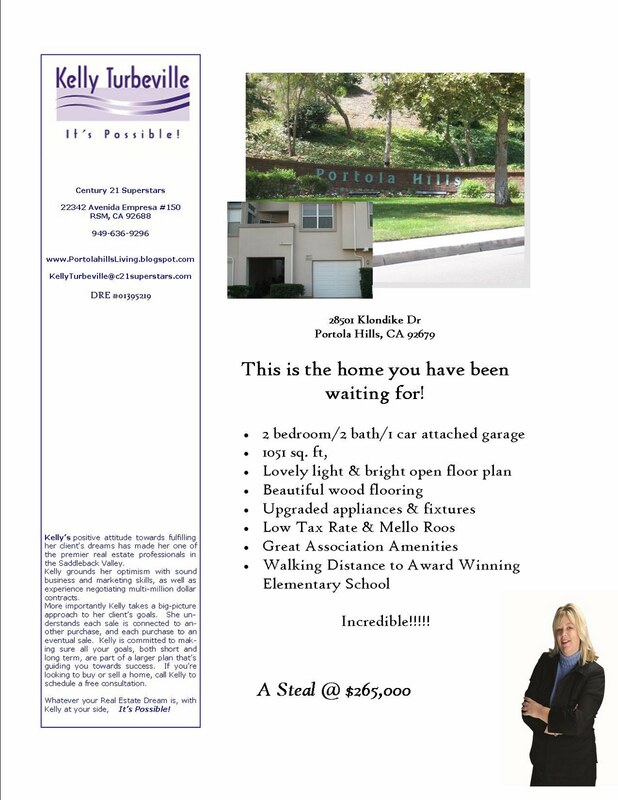 Whatever your Real Estate Dream is, with Kelly at your side, It's Possible!